Endocytosis is important for plasma membrane homeostasis, modulation of signal transduction, drug delivery, pathogen entry, and nutrient uptake. Defects in endocytosis have been linked to cancer and heart disease . Internalization of receptors, lipids, pathogens and other cargo at the plasma membrane involves several different pathways and requires coordinated interactions between numerous protein and lipid molecules . Until recently, the actin cytoskeleton and the endocytic machinery were thought to operate independently. However there is growing evidence that F-actin plays a direct role during endocytic internalization. Genetic studies in yeast have firmly established a functional connection between actin and endocytosis . Identification of several proteins that may function at the interface between actin and the endocytic machinery has provided further evidence for this association in both yeast and mammalian cells . As described further below, several of these proteins are directly involved in regulating actin assembly and could thus harness forces produced during actin polymerization to facilitate specific endocytic steps. Riezman and colleagues began isolating “end” mutants defective in receptor-mediated endocytosis a little over 12 years ago . Unexpectedly, some of the first mutants identified were in ACT1 (END7), the only yeast actin gene, SAC6, encoding the F-actin cross-linking protein fimbrin, and SLA2 (END4), encoding an actin-binding protein important for polarization of the actin cytoskeleton [4-6]. In addition, a number of laboratories have contributed to the isolation of about sixty-five genes that are important for receptor internalization, making yeast a robust system for studies of endocytosis. 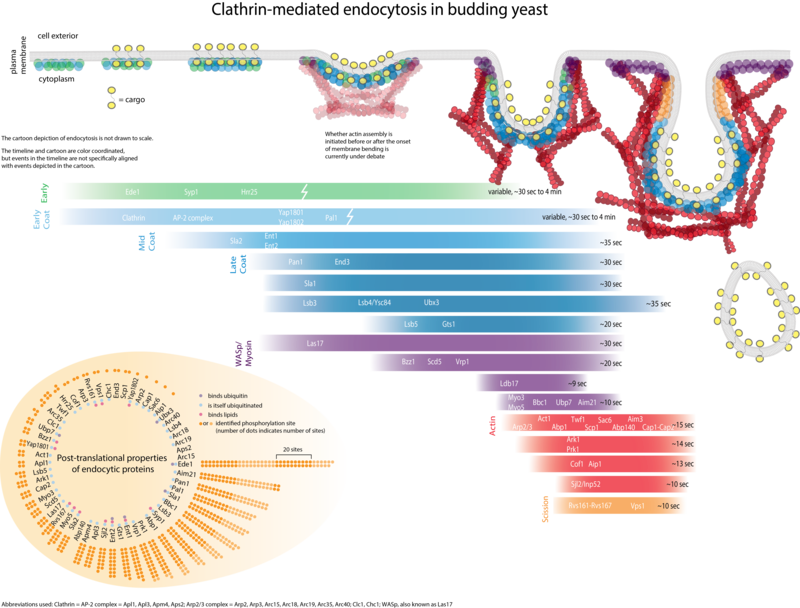 Moreover, the majority of these genes encode proteins that either have homologues in mammalian cells or that have domains that share homology with domains present in mammalian proteins, suggesting that principles learned from studies in yeast can be translated to mammalian cells. It is important to note that there appear to be some differences between endocytic mechanisms in yeast and mammals. First, the importance of actin assembly for endocytosis is in general greater in yeast than in mammalian cells . Second, in contrast with mammalian cells, endocytosis in yeast appears not to depend on the GTPase dynamin . Proteins important for endocytic internalization can be placed broadly into five groups based on their activities and properties: (I) activities affecting actin organization/dynamics; (II) activities regulating membrane lipid composition (sterols, phospholipids, and sphingolipids); (III) activities affecting post-translational modifications of receptors and/or other proteins important for internalization (e.g., phosphorylation and ubiquitination); (IV) activities regulating clathrin assembly (including clathrin); and (V) lipid and/or receptor binding involving adaptor proteins that link endocytic components to the plasma membrane. So far, about a third of the endocytic proteins in yeast have been shown to directly regulate actin assembly and/or to bind to actin (Group I). Considered together with the observation that most endocytic mutants also have actin defects, these observations strongly suggest that actin is required for endocytic internalization in yeast. A role for actin in endocytosis is also supported by the fact that yeast cells treated with Latrunculin-A (Lat-A), which sequesters G-actin, have endocytic defects . It is important to note that only a subset of the proteins important for normal actin organization are important for endocytic internalization . This suggests that defects in the actin cytoskeleton are not a secondary effect of blocking endocytic internalization or vice versa. Actin organization in yeast – are cortical actin patches sites of endocytosis? Yeast cells contain three types of actin filament-based structures: actin cables (AC), an actin-myosin contractile ring (CR) that mediates cytokinesis, and cortical actin patches (AP). Actin cables are bundles of actin filaments aligned with the mother-bud axis of yeast cells. They are involved in polarized secretion and organelle and mRNA transport from the mother cell to the bud . Cortical actin patches are the least understood of the three types of yeast F-actin structures. The patches appear by fluorescence microscopy as cortical puncta, and they localize near actively growing regions of the cell surface . Actin patches are highly dynamic structures. They persist for approximately 15s, and they assume either highly motile states, moving rapidly (velocities up to 1.9 μm/s), or stationary states [13-15]. Our earlier ultrastructure analysis of actin patches suggested that they associate with membrane invaginations , but how actin is organized around these invaginations was not determined. A host of actin-binding proteins and regulatory proteins are components of actin patches. Interestingly, many proteins important for endocytic internalization are either tightly associated with cortical actin patches or they colocalize partially with cortical actin patches . Components of other actin structures (e.g., actin cables and the actin-myosin contractile ring) do not appear to be involved in endocytosis and are not associated with patches. Protein-protein interactions – How is the actin assembly coupled to endocytosis? Genetic screens have led to the identification of many yeast proteins important for endocytic internalization. Presently, the challenges are to elucidate the specific role of each of these proteins and understand at the molecular level how the actin cytoskeleton participates in internalization. Biochemical studies are beginning to reveal activities for some of these proteins, and to provide information on how they interact with each other in the cell. The figure illustrates some co-immunoprecipitation and two-hybrid interactions among proteins important for internalization, and biochemical activities that have been identified. The Arp2/3 complex is composed of seven highly conserved subunits (Arp2p, Arp3p, Arc40p, Arc35p, Arc19p, Arc18p, and Arc15p), wherein Arp2p and Arp3p are actin-related proteins . The Arp2/3 complex can nucleate actin filament assembly, and assembly of branched actin filament networks, but it requires an activating co-factor to do so. WASP is the most well studied cellular Arp2/3 activator. Conditional alleles of ARP2 (arp2-1) are defective in endocytic internalization . Since overexpression of Las17p (yeast WASP) suppresses the actin and the endocytic defect of arp2-1 (in this case Lucifer yellow uptake was measured), actin nucleation mediated by the Arp2/3 complex appears to be required for internalization . Mammalian N-WASP has recently been implicated in endocytosis, suggesting that this Arp2/3-related function is conserved in mammalian cells . Besides yeast WASP, we have shown that two additional proteins, Pan1p and Abp1p, activate the Arp2/3 complex [25, 26]. In addition, redundant type I myosins, Myo3p and Myo5p, bind to the Arp2/3 complex and genetic and biochemical data suggest that they may activate the Arp2/3 complex . Pan1p is required for endocytosis and normal actin organization in yeast, and it interacts physically with several other proteins important for internalization . Similar to las17 and pan1 mutants, mutants of Myo3/5p have severe defects in endocytic internalization and in actin organization . Pan1p, Las17p, Abp1p and Myo3/5p each participate in a network of interactions with other proteins important for endocytic internalization . Yeast endocytic internalization therefore provides excellent opportunities for investigations of Arp2/3 complex regulation. In addition to an apparent requirement for actin filament nucleation, there is also evidence that actin filament turnover is required for endocytic internalization. Jasplakinolide, a drug that stabilizes F-actin, inhibits yeast endocytosis . Furthermore, we showed that Cof1p (Cofilin), which severs and depolymerizes F-actin, is critically important for Lucifer yellow and α-factor internalization . Consistent with these results, we showed that an actin mutant (V159N) defective in actin filament disassembly was also defective in Lucifer yellow endocytosis . Since these chemical inhibitors and mutants limit disassembly and the available G-actin pool, it is currently not clear whether new assembly, disassembly, or both, are required. 1. Conner, S.D. and S.L. Schmid, Regulated portals of entry into the cell. Nature, 2003. 422(6927): p. 37-44. 2. Engqvist-Goldstein, A.E. and D.G. Drubin, Actin assembly and endocytosis: from yeast to mammals. Annu Rev Cell Dev Biol, 2003. 19: p. 287-332. 3. Qualmann, B., M.M. Kessels, and R.B. Kelly, Molecular links between endocytosis and the actin cytoskeleton. Journal of Cell Biology, 2000. 150(5): p. F111-6. 4. Raths, S., et al., end3 and end4: two mutants defective in receptor-mediated and fluid-phase endocytosis in Saccharomyces cerevisiae. J Cell Biol, 1993. 120(1): p. 55-65. 5. Kubler, E. and H. Riezman, Actin and fimbrin are required for the internalization step of endocytosis in yeast. Embo J, 1993. 12(7): p. 2855-62. 6. Wesp, A., et al., End4p/Sla2p interacts with actin-associated proteins for endocytosis in Saccharomyces cerevisiae. Mol Biol Cell, 1997. 8(11): p. 2291-306. 7. Fujimoto, L.M., et al., Actin assembly plays a variable, but not obligatory role in receptor-mediated endocytosis in mammalian cells. Traffic, 2000. 1(2): p. 161-71. 8. Baggett, J.J. and B. Wendland, Clathrin function in yeast endocytosis. Traffic, 2001. 2(5): p. 297-302. 9. Ayscough, K.R., et al., High rates of actin filament turnover in budding yeast and roles for actin in establishment and maintenance of cell polarity revealed using the actin inhibitor latrunculin-A. J. Cell Biol., 1997. 137: p. 399-416. 10. Pruyne, D. and A. Bretscher, Polarization of cell growth in yeast. I. Establishment and maintenance of polarity states. Journal of Cell Science, 2000. 113(Pt 3)(6799): p. 365-75. 11. Bretscher, A., Polarized growth and organelle segregation in yeast: the tracks, motors, and receptors. J Cell Biol, 2003. 160(6): p. 811-6. 12. Adams, A.E.M. and J.R. Pringle, Relationship of actin and tubulin distribution in wild-type and morphogenetic mutant Saccharomyces cerevisiae. J. Cell Biol., 1984. 98: p. 934-945. 13. Doyle, T. and D. Botstein, Movement of yeast cortical actin cytoskeleton visualized in vivo. Proc. Natl. Acad. Sci. USA, 1996. 93: p. 3886-3891. 14. Waddle, J.A., et al., Movement of cortical actin patches in yeast. J. Cell Biol., 1996. 132: p. 871-870. 15. Smith, M.G., S.R. Swamy, and L.A. Pon, The life cycle of actin patches in mating yeast. Journal of Cell Science, 2001. 114(Pt 8): p. 1505-13. 16. Mulholland, J., et al., Ultrastructure of the yeast actin cytoskeleton and its association with the plasma membrane. J. Cell Biol., 1994. 125: p. 381-391. 17. Warren, D.T., et al., Sla1p couples the yeast endocytic machinery to proteins regulating actin dynamics. J Cell Sci, 2002. 115(Pt 8): p. 1703-15. 18. Mulholland, J., et al., Visualization of receptor-mediated endocytosis in yeast. Mol Biol Cell, 1999. 10(3): p. 799-817. 19. Hicke, L. and R. Dunn, Regulation of membrane protein transport by ubiquitin and ubiquitin-binding proteins. Annu Rev Cell Dev Biol, 2003. 19: p. 141-72. 20. Howard, J.P., et al., Sla1p serves as the targeting signal recognition factor for NPFX(1,2)D-mediated endocytosis. J Cell Biol, 2002. 157(2): p. 315-26. 21. Welch, M.D. and R.D. Mullins, Cellular control of actin nucleation. Annu Rev Cell Dev Biol, 2002. 18: p. 247-88. 22. Moreau, V., et al., The yeast actin-related protein Arp2p is required for the internalization step of endocytosis. Molecular Biology of the Cell, 1997. 8(7): p. 1361-75. 23. Madania, A., et al., The Saccharomyces cerevisiae homologue of human Wiskott-Aldrich syndrome protein Las17p interacts with the Arp2/3 complex. 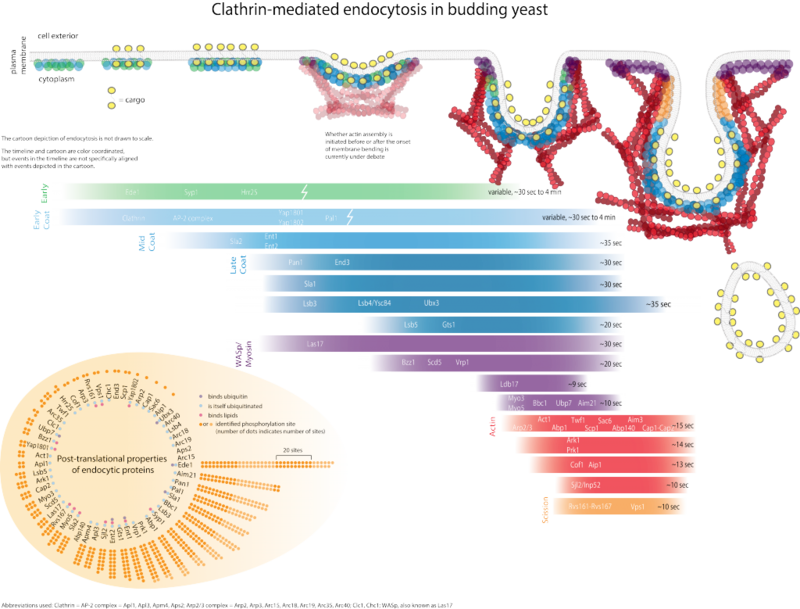 Molecular Biology of the Cell, 1999. 10(10): p. 3521-38. 24. Kessels, M.M. and B. Qualmann, Syndapins integrate N-WASP in receptor-mediated endocytosis. Embo J, 2002. 21(22): p. 6083-94. 25. Duncan, M.C., et al., Yeast Eps15-like endocytic protein, Pan1p, activates the Arp2/3 complex. Nature Cell Biology, 2001. 3(7): p. 687-90. 26. Goode, B.L., et al., Activation of the Arp2/3 complex by the actin filament binding protein Abp1p. Journal of Cell Biology, 2001. 153(3): p. 627-34. 27. Lechler, T., A. Shevchenko, and R. Li, Direct involvement of yeast type I myosins in Cdc42-dependent actin polymerization. J Cell Biol, 2000. 148(2): p. 363-73. 28. Lee, W.L., M. Bezanilla, and T.D. Pollard, Fission yeast myosin-I, Myo1p, stimulates actin assembly by Arp2/3 complex and shares functions with WASp. Journal of Cell Biology, 2000. 151(4): p. 789-800. 29. Wendland, B. and S.D. Emr, Pan1p, yeast eps15, functions as a multivalent adaptor that coordinates protein-protein interactions essential for endocytosis. Journal of Cell Biology, 1998. 141(1): p. 71-84. 30. Geli, M.I. and H. Riezman, Role of type I myosins in receptor-mediated endocytosis in yeast. Science, 1996. 272(5261): p. 533-5. 31. Ayscough, K.R., Endocytosis and the development of cell polarity in yeast require a dynamic F-actin cytoskeleton. Curr Biol, 2000. 10(24): p. 1587-90. 32. Lappalainen, P., et al., Essential functions and actin-binding surfaces of yeast cofilin revealed by systematic mutagenesis. EMBO J., 1997. 16: p. 5520-5530. 33. Belmont, L.D. and D.G. Drubin, The yeast V159N actin mutant reveals roles for actin dynamics in vivo. Journal of Cell Biology, 1998. 142(5): p. 1289-99.